It’s easier than ever to find, subscribe and listen to hundreds of podcasts on every topic from spin-offs of your favorite Bachelor season to comedy, education, sports, technology, health, hobbies, and more. Podcasters create content and publish their episodes on popular platforms like iTunes, Google Play, their website, as well as a variety of other podcasting directories and apps. 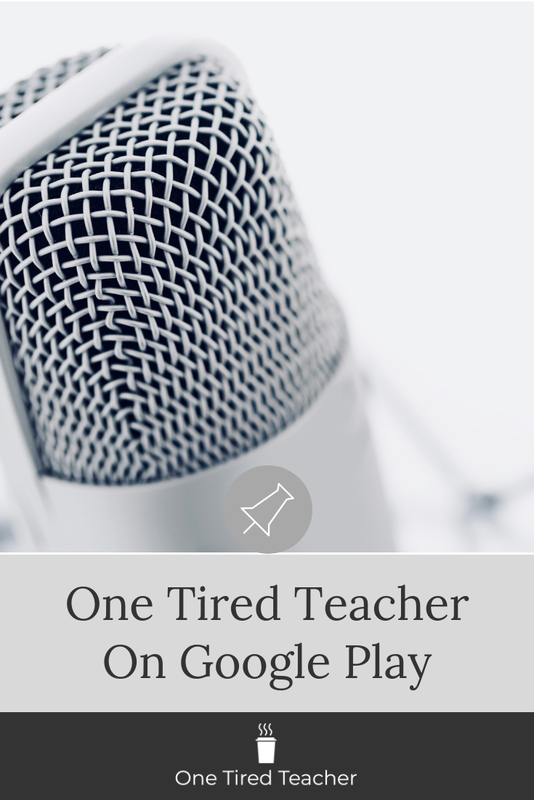 I recently published a podcast called One Tired Teacher. My podcast features guest educators each week where we dive in to share the trials and treasures of teaching and speaking our truth. My show is available each Thursday. You can listen from three different platforms. So why should you listen to teaching podcasts? Many podcasts, including my own, were created to connect with their audiences. So if you want to feel connected to a topic, subject, or common interest, then tuning in every week can bring you a sense of connection and engagement. I also created my podcast so that teachers and educators can feel heard. I think that a lot is going on in education good and bad that needs to be shared. Educators have the privilege of being a part of something bigger than themselves. Sharing our work and our thoughts push for change from the ground up. And sometimes, it helps to know that other people get us. I remember when I was in the classroom for 18 years, I needed desperately to know that someone understood what was happening in my day to day existence. I needed to share my successes with others because they came at a high emotional cost. I also needed to share my frustrations because they went with an even higher emotional price tag. Podcasts such as Ted Talks can be inspiring and educational. There are just so many great shows out there from which to learn and be motivated. I hope that mine will be included in the list of podcasts that inspire and educate. So far I've spoken to a second-grade teacher, Melanie Redden who shares her beautiful experiences and wealth of knowledge on building rapport with students and classroom management. I've also talked to an outstanding ESE teacher, Nichole Maas. Nichole shares the tired of ESE and how difficult this current system is for kids who learn differently. I've also spoken to an exceptional 2nd-grade teacher, Rachel, who shares all about the influence of administration on the culture of a school. I have over 50 ideas and more than a few handfuls of guests on the books for future episodes, as well. I can't wait to share it all with you. Podcasts are perfect for long commutes. When I was driving 45 mins to an hour a day, I listened to a lot of podcasts and YouTube videos on various teaching practices to help me in my job transition from administrative support to the media specialist at an intense Title One School. I felt like a first-year teacher on year 18! I needed as much information as I could get on Whole Brain Teaching and Trauma-Informed Teaching. Podcasts were a huge help. Podcasts are also a great way to personally and professionally grow while on the go. You can be on the treadmill and listen or even cleaning your house or classroom. That's the beauty of a podcast. All you do is listen. I hope you will take me with you on your next long commute or while you push through another mile on the treadmill. I hope to offer you inspiration and information. I would love to hear from you. If you have an excellent idea for a new episode, shoot me an email or comment below. Want to be a guest? Have something to say? Let me know! I would love to talk to you. The world of podcasting can be exciting and overwhelming. I'm telling you, once you get started you are hooked! Make sure to subscribe to your favorites, so you don't miss anything. And share the love! Rate the show, leave feedback, and share it with your friends. The person behind the mic will greatly appreciate it. Happy Teaching and Learning and Sweet Dreams!